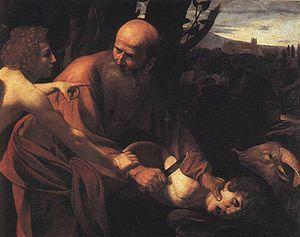 The Sacrifice of Isaac, Ufizzi Gallery, Florence. NAPLES, FLORIDA -- “Only the good die young.”- Billy Joel. Just back from Rome at my house in Florida, in the woods, thoughts and visions of Caravaggio were still fresh in my head. At an impromptu party in the garage of my neighbor Eric, the conversation turned to a discussion of the fact that most of the long haired young guys of the Southern Rock band on the overhead video are dead, probably from drugs. That’s right an overhead video in a garage. It is a big garage with twenty foot high ceilings and a 1969 Mustang Fast Back Coupe, a 1957 Chevy pickup truck, parts of antique cars, some hanging from the roof, and vintage motorcycles. And when Police Detective Eric plays this music I know that a party is beginning. It is not far but I always go on my scooter, it is a tradition, but Eric tells his friends that it is so I won’t be bitten by an alligator. Billy Joel, the famous American singer-songwriter, “The Piano Man”, bought a painting from me a few years ago in Gloucester, Massachusetts at my studio-gallery. It was seven in the evening and I was exhausted and hungry about to go home but I couldn’t stop painting. A couple looked in the door and a man said “Are you open?” I didn’t look up, and I said “No, but you can come in.” Then I recognized him, but I was in a strange painting mood and I said, “You are very famous, right?” He shrugged. Then I said, “Oh no, you’re a celebrity look a like.” Then he handed me his American Express card, I said, “Billy, I was just busting …. … .” We became friends at that point and it was comfortable because I viewed his fame as a burden that he carries that is separate from him. I thought he was comfortable with his great abilities and think he still is. In previous articles I tried to establish that Caravaggio was a great and revolutionary painter often rejected professionally and having a tough time in daily life. He killed a man and left Rome a wanted man, never to return. Finally, I suggested that he knew how great he was. At the Opera house in Paris after the debut of Carmen, the supposedly sophisticated audience laughed and shrieked. Georges Bizet went to the streets of Paris and walked. He was dead at thirty six years old. George, we know how great Carmen is, and thank you. Van Gogh sold one painting in his life. Modigliani threw his unappreciated limestone and marble sculptures into the Seine. Caravaggio strides across both groups, the unappreciated ones, as well as the Marilyn, Elvis artists who were smothered by too much adulation. His competitors while copying his style and innovations often got the good commissions rather than him. Raphael died young but his death and life were graced like his art. The pope allowed his mistress to stay with him in the papal palace while he frescoed the walls of the pope’s apartments. He died painting his Transfiguration, unfinished, but not looking so, now in the Vatican Museums, he was working on the Christ figure. The painting was carried leading his funeral procession through Rome. He is buried in the Pantheon. Janis Joplin was a bright unexpected flame that burned for a short time, extinguished by drugs. I do not intend any disrespect but it is hard to imagine a great old Janis. Her gift was tied to youth. I am amazed that Caravaggio could paint on the run, island and city hopping in the Mediterranean. Most of his paintings were so big that they would not fit through the door of my studio. The support system of monasteries, convents, and palaces in the places of the four year exile must have been impressive. The world was bigger or smaller then, depending on how you look at it. He was not threatened by extradition. Hollywood film director, Roman Polanski, is for his past crimes in the United States. For Caravaggio the “price on his head” was literal. In other words if you could produce his head in a basket, you got the reward. He was comfortable enough on the run to continually paint masterpieces. The subject often would be whatever saint the monastery was named after. But then he would get paranoid about bounty hunters finding him, and he would move on. There are paintings that have decapitations and blood. 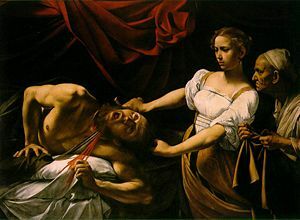 David and Goliath, Judith Beheading Holorfernes, Salome with the head of John the Baptist. Because he lived in a different time we take the paintings as allegorical and historical. They are in fact close to being autobiographical. Judith Beheading Holofernes, Galleria Nazionale dell'Arte Antica, Rome. If Caravaggio lived today would we read about his quiet overdose? That’s not nearly as interesting as sword fighting, the price on his head, his painting himself as Goliath, and running after the boat and dying on the beach. When looked at closely, all lives can appear small and the same. They all have some greatness, some pain, some failures, rising youth, declining age, and death. Where does the self destructiveness of great creative talents come from? Is it as simple as the fact that they become mad by failing to put the big round peg of great creativity into the small square hole of ordinary life? We thank them even as they fail, because it enables us to live our lives bigger. We drank cold beer and shook our heads because those Rock musicians died so young. 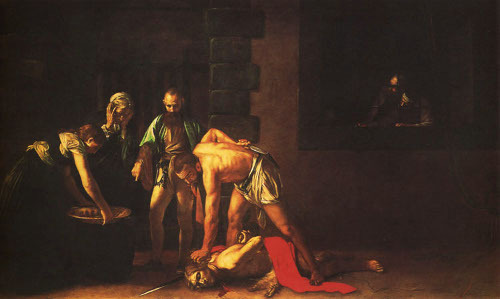 Beheading of John the Baptist, St. John’s Cathedral, Valetta, Malta.